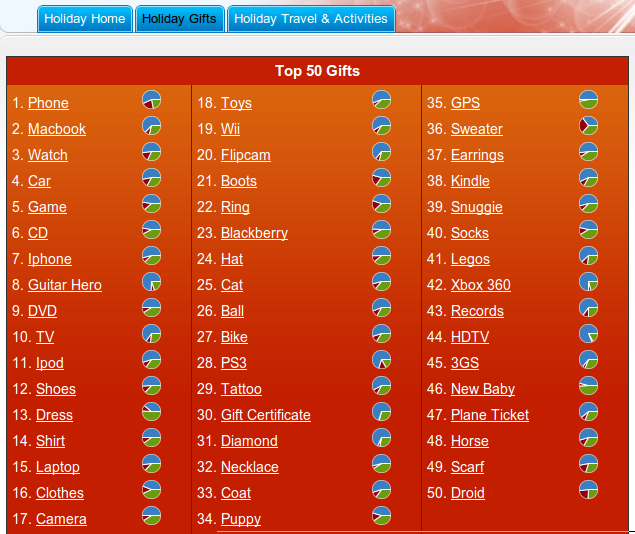 What are the Top 50 Most Popular 2009 Holiday Gifts? Click image to find out. Businesses have access to a new TipTop Twitter search tool that allows them to do real time semantic research into holiday purchases. While a little late for this year’s peak holiday shopping season, what the results reflect can be used for positioning offerings to match what consumers are most interested in. This allows ecommerce stores and affiliate marketers to prioritize what they choose to promote and which pages of their sites to optimize first. Imagine being able to find out what gifts are most popular before you decide which products to feature in your newsletter, on your blog, or to share across Social Networks? Now you can. This concept may seem a little confusing at first so please keep reading as I explain the benefits through some specific examples of how to apply the information you can obtain using this tool. Share your post across Social Networks. This image shows results for an advanced search for words related to holiday shopping plus the word in the list. The top listing is for phone and we all know that phones are a popular gift item. If you belonged to the gift affiliate program I manage for Executive Gift Shoppe’s personalized gifts you could use that information to generate sales by matching your posts and Tweets to what consumers are most interested in just as their interest is peaking. Interested in a new career? Get Cisco Certified with guaranteed 350-040 dumps with free demo test engine. Just go through 350-050 dumps and pass exam on first try. Also download 352-001 dumps for next exam. Using our list above, we have completed Step 1: identifying a trend: cell phones. Step 3 is to write a blog post. Blog posts are a great way to increase visibility during key times – and the shopping holiday season is especially important to many businesses. What you choose to write about during any peak buying season can greatly increase incoming links, visibility and sales. Step 4: If you use the Zemanta browser plugin, each post you write is suggested to other bloggers. By publishing new time-sensitive posts when interest is highest, more bloggers will see them and can include a backlink to your post with one click. 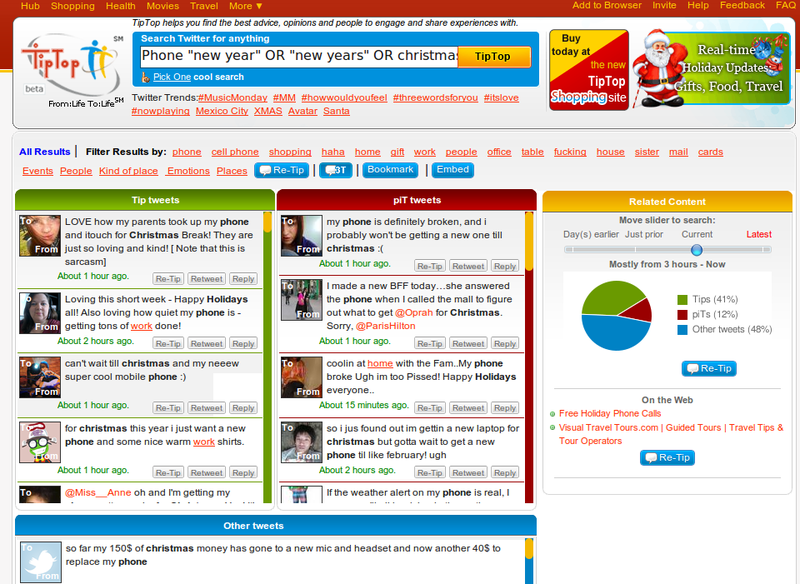 Step 5: Click on the word cell phone on the Top 50 Gifts page and you will be taken to the Twitter results for all the phone related Tweets. This page takes a while to load because TipTop is generating the latest results live. You can modify the search with the filters shown at the top of the page or by changing the search shown in the Search Twitter for anything box and clicking TipTop to generate new results based on your changes. The yellow Related Content column allows you to change the timeframe you’re searching. NOTE: Because of the complexity of languages and the multiple meanings of many common words you will see that many of the Tweets are not going to be relevant to your research. Disregard those and focus on those that ARE relevant. Step 6: You may find Tweets you can reply to or from Twitter users who may be interested in your new post; sometimes you won’t. Even if you don’t, the research will still give you ideas for posts that will have strong potential audiences. You can also hone in on the optimum times for promoting seasonal products. Share your targeted post with those who have recently Tweeted about that topic and across Social Networks. 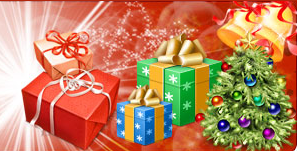 You can read more details in the Press Release about the new Tip Top 2009 Holiday Search Special. Love this, this is so beneficial and easy to apply! love your input about the legos! Thanks for the link. Have you seen my Twitter Best Practices post or my most recent post on geo-targeting Twitter? Maybe if I can find the time this month it would be a good time to prepare for coming Christmas madness. I think TipTop as a search tool has been very helpful in guiding a user to find advice and answers in a faster and more accurate way since it finds what’s useful and interesting and filters out what’s not relevant to the researched topic. Never heard of TipTop until I stumbled upon this article. Awesome write up and I hope you continue writing more interesting posts like this. Bookmarking this page now to return again. Great post you have here,In addition, products like TipTop Shopping with customizable search widgets, bring together consumer reviews, social search, and sentiment analysis enabling product comparisons across attributes like overall value and aiding purchasing decisions through user-driven product tips and pits. TipTop is a great tool, I have been setting up RSS feeds for certain terms in Tweetdeck, but this post has convinced me to switch over to TipTop to capitalize on trends instead of relying on Google Trends to tell me what is popular after the fact. Okay, so help me understand this better if possible. Is the purpose of this to look for people on Twitter who might be interested in a particular product and thus produce sales from them, or are we just trying to identify hot trends and write a blog post on that hot item hoping that the blog post gets a lot of traffic because it’s about a particularly hot topic? Some businesses use search to respond to questions about products they sell or services they provide. I often use it to find quotes, buzz and reviews on events to add them to blog posts. You could also use it to identify trends and publish content while a topic is hot. Search on the Twitter site itself is often very limited so you can find vastly more information on TipTop than you can at Twitter. My friend has a SEO business and is doing a fare job. What is the price of TipTop for Real Time Market Research tool or is it free for usage? It seems to be a user friendly market research tool. Even I have plan to venture into affiliate marketing niche. Hence, I found your blog simple and thoroughly detailed. Thanks for the post. TipTop is a free search engine. I’ve had the best results from twitter for step 6. I wasn’t following your steps exactly in the way I was doing it. But now that I’ve seen this, I’m going to try it exactly your way. The post is really good, as it provides real good information, which is really useful for my work, as it makes it simpler and easier. Important article – an important concept of making money on the web is getting traffic but this article shows what’s even more valuable is getting traffic to a product or niche that is in current demand. Tip Top seems like a very cool thing. Could be helpful with the holidays coming up in a few months. I’m going to read this a few more times so I can really grasp what is going on and then check it out. Thanks for bringing this up. I probably would have never known. There is some very valuable information here, possibly more valuable than even the author realized when writing this. This is worthy of reading several times to come up with even more potential uses than even talked about here. For example by writing blog posts on current “in the hot trends” areas you could increase the number of other blogs linking to your post, which obviously has more traffic and improved search engine ranking implications. One of the great things about the real-time web is to learn what topics are being talked about the most right now. .-= Bonita@Pop Up Displays´s featured blog ..How Much Fun Can You Have With Pop Up Displays? =-. Wow this feeltiptop website looks really great, it can help many marketers choose what kind of niche their going to build. High quality content of blog will always awaiting for the reader. It should be useful for others. This is a great review. I like very much the screenshots and the article. It’s a great resource if you need valuable information. You should write similar articles because the subject is interesting. .-= James@Nokia C6´s last blog ..Microsoft Kin One smartphone =-. Excellent information – an additional thing to consider is which of the hot gift items also are popular items for the entire year, not just at Christmas. This way the work you do can pay off for the entire year. .-= Jean @ PeoplezWireless PHPI Cell Phones´s last blog ..PeopleHelpingPeople – Case for a Cell Phone Business =-. That’s great advice. I’d only thought of about half of those. I’m definetely going to have to try them all to reach my goal. Thanks as always for the insightful posts. Hi! I am thoroughly impressed with your knowledgeable Thoughts. Your insights into this article was well worth the the time to read it. I thank you for posting such awesome information. Thanks for the great tips. time of economical downturn could be not so easy, but it is still possible. I have got it few weeks ago. What is my secret? I have done everything in a similar way, which is described in this article, and I succeeded. So don’t think that there are only empty words, just try and maybe after few weeks you will get success. .-= monika@auto loan calculator´s last blog ..Car payment by the loan lenders =-. I think blog post is one of the most crucial if not THE important part. The content on it would definitely make you different from others. You will be able to get first time visitors easily but this is not the deciding factor, the number of returning visitors would certainly set you apart. It is a very useful tool indeed. .-= Eren@ homemaking´s last blog ..How to stay calm while being more productive =-. Great to see the lists here and great tips given here .This will really help for business growth but in this time of recession its pretty tough to go on .thanks ! .-= Gomez@windshield quote´s last blog ..Avoiding Insurance Fraud =-. This is an excellent post about TipTop with lots of good tips. I am also encouraged by the positive comments from a number of folks in the discussion section. TipTop is work in progress. It is being built for users so that they can be lot more successful at whatever they do. Please send us feedback. Even the most outrageous needs will be gratefully acknowledged and, if possible, worked upon promptly. Someday soon, we want you to live and breathe TipTop, not anything else. Kewl! TipTop! Crazy name! gonna Try! .-= Chethan´s last blog ..5 Fingers of Your Blog Hand- Google, Facebook, Twitter, Digg, Reddit =-. Another great post. Thanks a lot for sharing with us your knowledge and resources. Happy Holidays!!! .-= Teena@Brisbane Hotels´s last blog ..Boxing Day sales up on 2008: Retailers =-. Very nice to read these post & thanks for sharing such type of very interesting posts, please keep sharing updated posts. The psychic in me sees another post to read multiple times, lol. Very cool stuff though. Possibly a really cool leg-up for those that can’t get anywhere with sales at saturated places like eBay. .-= Dennis Edell´s last blog ..The Final “Official” Post For DSWM! =-. There is always more we can do than we have time to do. I will write more as I find ways to apply TipTop data to growing blogs and businesses. .-= GrowMap´s last blog ..MEME: LinkLuv to My Fav Bloggers Favs =-. Really it is very useful & thanks for sharing such a very nice information & please keep sharing such a informative post I like to read these post very much & have a great Christmas. wow great ideas you posted here really all the three steps are up to the mark very easy to understand and simple to follow.thanks for sharing your information. Business as usual will not be enough during economic downturns. Every business must work much harder to increase visibility and sales now. Even if they have always had loyal customers, when those customers have less money all businesses they deal with will experience downturns. That is what we do here: teach businesses new strategies for growth. Start with the post in this reply. It is the most important advice I have ever given here. Market research is very much important for grow our blog market. We should know which products are hot now, so that we can easily sell products. BTW thank you for sharing your thoughts. .-= chandan´s last blog ..Work at home | Freelancing PDF converting job =-. Every blog or business should keep many types of eggs in their strategy baskets. While much money can be made on hot products it is equally important to have bread-and-butter products that sell consistently well all of the time. This tool is useful for identifying both. .-= GrowMap´s last blog ..FTC Disclosure Rules: What You Need to Do =-. .-= free web templates´s last blog ..HPA Wood =-. Tip Top has been around for a while but many don’t know about it yet. They regularly introduce new features and as time allows I will write more about how we can use them. .-= GrowMap´s last blog ..Donation Coder Annual New Apps for the New Year NANY 2010 Annual Challenge =-. Twitter usernames and Web site URLs can not have spaces in them. If you don’t have a Twitter account just leave that field blank. If you do, make sure you enter it exactly the way it is on Twitter. This whole concept seems very easy but for some reason I just don’t have the mind to think of these things before the rest are all over it. .-= Josiah@Watch Mythbusters Online´s last blog ..Episode 15: Subwoofer Rough Road Driving =-. Don’t feel bad because it is not a simple concept and most people are not going to easily understand it. As strategies that I write about go this one is pretty complicated. The most important thing I’ve ever written is explained in the post I’ll feature in CommentLuv for this reply. I recommend that one as something you do want to figure out and I will assist if you could use some input into it. In the case of your site you would first want to rank for a phrase related to the name of that show and then possibly for the major actors in it or possibly even the names of episodes. You would have to check to see how many searches there are for each potential keyword phrase. twitter search is bring me traffic. .-= Jack@File Search Engine´s last blog ..Zippyshare com Culture Beat Cant Go On Like This No No CJ S =-. If you want us to understand your site we need more details and an explanation of what we would do with it. What files are you searching where? Also, how exactly is Twitter search bringing you traffic? We like to discuss strategies here. Great tutorial! I wish this came sooner for holiday shopping, but will definitely use that tool. Trends are always crucial in identifying hot products as those will always sell especially when promoted correctly. .-= JR @ Internet Marketing´s last blog ..Search Hot Keywords with Comprehensive Info with Free Toolbar =-. This is brand new – just launched and ready for public use shortly before I wrote about it. I know the developer and regularly check in with him to see what he is working on and what else is new in TipTop. I am glad you found your way here and I now know where your blog is. I noticed that your CommentLuv comments are redirecting through Feedburner which means the links are benefiting them instead of your blog. There is a setting in Feedburner to change that. If you don’t see it connect with me and we’ll compare your setting to mine and figure it out again. Check out the post I’ve featured in CommentLuv. If you send me your best anchor text and links when I link to you I’ll use them. (I keep track of the blogs I regularly link in.) I’d like to connect with you and sent you an email through your contact pages. I am also expecting the phone from my brother this Christmas. Just remember this is only an example. Anyone can do as many live searches at TipTop as they wish. You or your brother might want to use it to see which phones are popular and especially check for reviews indicating problems with them. You may want to check especially for comments from others in the areas where you plan to use the phone as different phones are tied to different companies and service quality varies greatly for every company across different locations. .-= GrowMap´s last blog ..Copied Comment Spam and eBusiness Ethics =-. Im diggin the legos. Good post and great resource. Glad to see you’re checking out the data TipTop offers. I’m wondering why the links for Michael Mesa Miami? Care to share? Just thought you should know that this comment could be the poster child for the type of comments most bloggers will delete. Seriously. If you don’t want your links deleted you have to be more creative. 1) Free WHAT? Unless curiosity is what you are hoping will get someone to click through to your site it might be better to use Free Samples. I agree that this could be very beneficial. Interesting thing on the list: no. 50 – droid. I would like to be given a droid. That will link to only the phrase head pieces. I’ve got to write that post on the best ways to use KeywordLuv. .-= GrowMap´s last blog ..How Many Are Done with Their Holiday Shopping? =-.